What is GDP and why does it matter? Discuss the positive outcomes of market-oriented policies (such as liberalized trade and capital flows, privatization and deregulation), including a more efficient allocation of resources and economic growth. Discuss the negative outcomes of market-oriented strategies, including market failure, the development of a dual economy and income inequalities. Discuss the strengths of interventionist policies, including the provision of infrastructure, investment in human capital, the provision of a stable macroeconomic economy and the provision of a social safety net. Discuss the limitations of interventionist policies, including excessive bureaucracy, poor planning and corruption. Explain the importance of good governance in the development process. Discuss the view that economic development may best be achieved through a complementary approach, involving a balance of market oriented policies and government intervention. Outline the meaning of foreign debt and explain why countries borrow from foreign creditors. Explain that in some cases countries have become heavily indebted, requiring rescheduling of the debt payments and/or conditional assistance from international organizations, including the IMF and the World Bank. Explain why the servicing of international debt causes balance of payments problems and has an opportunity cost in terms of foregone spending on development objectives. Explain that the burden of debt has led to pressure to cancel the debt of heavily indebted countries. We are first going to watch the documentary "Life and Debt" by Stephanie Black. See here for details. It's extremely relevant to this topic. Examine the current roles of the IMF and the World Bank in promoting economic development. Evaluate the effectiveness of foreign aid in contributing to economic development. Compare and contrast the roles of aid and trade in economic development. An alternative perspective on foreign aid here. NPR has a news broadcast here What happened to the aid meant to rebuild Haiti? When considering the advantages and disadvantages of international trade to LDCs, it is important to look at the implications for both growth and development. In terms of achieving economic growth, trade is very important because . . . However, when considering economic development, there are different arguments . . . When considering the advantages and disadvantages of foreign aid, it is important to look at the implications for both growth and development. In terms of achieving economic growth, aid can be very important in filling several gaps such as . . . However, the implications in terms of development are . . . Explain that aid is extended to economically less developed countries either by governments of donor countries, in which case it is called official development assistance (ODA), or by non-governmental organizations (NGOs). Explain that humanitarian aid consists of food aid, medical aid and emergency relief aid. Explain that development aid consists of grants, concessional long-term loans, project aid that includes support for schools and hospitals, and programme aid that includes support for sectors such as the education sector and the financial sector. Explain that, for the most part, the priority of NGOs is to provide aid on a small scale to achieve development objectives. Explain that aid might also come in the form of tied aid. Explain the motivations of economically more developed countries giving aid. Compare and contrast the extent, nature and sources of ODA to two economically less developed countries. How does NGO aid differ from ODA in terms of purpose or scale? Here are some recent statistics "Foreign aid reaches record high"
With reference to specific examples, explain how the following factors are barriers to development for economically less developed countries. With reference to specific examples, evaluate each of the following as a means of achieving economic growth and economic development. As you can see from the objectives above, this brings together a lot of the stuff we have already done on International Economics, with just a few new concepts. Click on this link for some very comprehensive information but also use Chapter 30 of the textbook to complete this document. Explain the meaning of the terms of trade. Explain how the terms of trade are measured. Distinguish between an improvement and a deterioration in the terms of trade. Calculate the terms of trade using the equation: Index of average export prices/index of average import prices x 100. Explain that the terms of trade may change in the short term due to changes in demand conditions for exports and imports, changes in global supply of key inputs (such as oil), changes in relative inflation rates and changes in relative exchange rates. Explain that the terms of trade may change in the long term due to changes in world income levels, changes in productivity within the country and technological developments. Explain how changes in the terms of trade in the long term may result in a global redistribution of income. Examine the effects of changes in the terms of trade on a country’s current account, using the concepts of price elasticity of demand for exports and imports. Explain the impacts of short-term fluctuations and long-term deterioration in the terms of trade of economically less developed countries that specialize in primary commodities, using the concepts of price elasticity of demand and supply for primary products and income elasticity of demand. You'll be getting another packet for this short topic.... and that's the end of TRADE! Explain why a deficit in the current account of the balance of payments may result in downward pressure on the exchange rate of the currency. Discuss the implications of a persistent current account deficit, referring to factors including foreign ownership of domestic assets, exchange rates, interest rates, indebtedness, international credit ratings and demand management. Explain the methods that a government can use to correct a persistent current account deficit, including expenditure switching policies, expenditure reducing policies and supply-side policies, to increase competitiveness. Evaluate the effectiveness of the policies to correct a persistent current account deficit. State the Marshall-Lerner condition and apply it to explain the effects of depreciation/devaluation. Explain the J-curve effect, with reference to the Marshall-Lerner condition. Explain why a surplus in the current account of the balance of payments may result in upward pressure on the exchange rate of the currency. Discuss the possible consequences of a rising current account surplus, including lower domestic consumption and investment, as well as the appreciation of the domestic currency and reduced export competitiveness. Continue on with the tasks contained in the Balance of Payments packet. Outline the role of the balance of payments. Distinguish between debit items and credit items in the balance of payments. Explain the four components of the current account, specifically the balance of trade in goods, the balance of trade in services, income and current transfers. Distinguish between a current account deficit and a current account surplus. Explain the two components of the capital account, specifically capital transfers and transaction in non-produced, non-financial assets. Explain the three main components of the financial account, specifically, direct investment, portfolio investment and reserve assets. 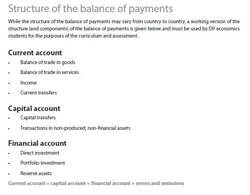 Explain that the current account balance is equal to the sum of the capital account and financial account balances. Examine how the current account and the financial account are interdependent. 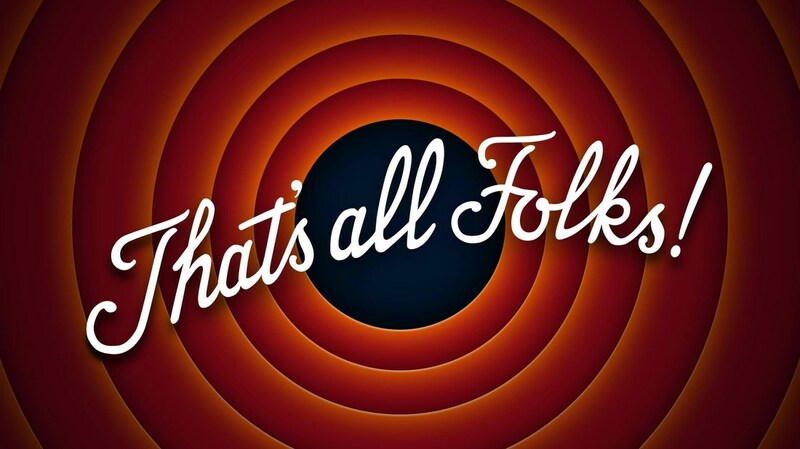 ​Check out this link to a Slideshare presentation. Describe a fixed exchange rate system involving commitment to a single fixed rate. Distinguish between a devaluation of a currency and a revaluation of a currency. Explain, using a diagram, how a fixed exchange rate is maintained. Explain how a managed exchange rate operates, with reference to the fact that there is a periodic government intervention to influence the value of an exchange rate. Examine the possible consequences of overvalued and undervalued currencies.